Fly safely and cost effectively with our solutions that identify and mitigate risk. Assess fatigue risk levels while planning upcoming schedules. Fleet Insight allows you to assess fatigue risk in future flights and duties as you plan your fleet’s upcoming schedule. You can bulk load schedules or link to a fully integrated scheduling tool to access this information automatically. As flight and duty schedules change, you can quickly identify high fatigue risk situations and evaluate mitigations with the click of a button using the objective, data-driven process of Fatigue Meter. Quickly identify non-conformances with FSF and EASA Duty/Rest limits. Assess fatigue risk in future flights. 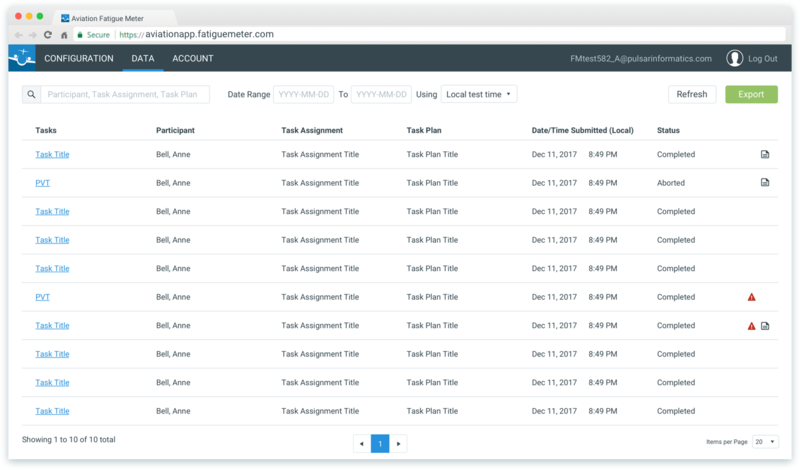 Fleet Insight is designed for the needs of Schedulers and Safety Officers. Bulk load schedules or link to a fully integrated scheduling tool to access this information automatically. Then monitor the fatigue risk profile for your entire scheduled operations. As flight and duty schedules change, you can quickly identify high fatigue risk situations and evaluate mitigations with the click of a button using the objective, data-driven process of Fatigue Meter. Identify non-conformances with flight/duty/rest industry standards. In addition to monitoring the flight and duty schedules for fatigue measures, Fleet Insight also provides alerts to highlight conflicts with the FSF/NBAA Duty/Rest Guidelines for Business Aviation April 2014. This further helps your organization conform to the standards and fly safely. Understand the causes of fatigue to help with mitigation. Understand exactly how operational factors such as long duty hours, jet lag, night work, and restricted sleep opportunities combine and contribute to elevated fatigue risk in each flight. In-depth understanding enables smarter mitigation strategies such as a crew reassignment. Add Fleet Insight to your workflow today. Give your crew access to their fatigue risk profile. Fatigue Meter PRO gives your pilots, flight attendants and maintenance workers the ability to monitor their own fatigue risk. Individuals can evaluate their flight and duty schedules alongside personal constraints and sleep habits to understand their own fatigue risk profile. Using the tool on a routine basis builds fatigue level awareness and can contribute to better sleep health. Sleep times can be calculated automatically or imported from your Fitbit®. Create and save trip scenarios for ease of access. Save your scenarios for later analysis, updating, or comparison. Scenarios are automatically synced, so whether you use a browser or your iPad you can open and update your saved scenarios from anywhere. Edit scenarios to keep them up to date with actual changes. Define your flight scenario. Enter in the flight schedule and duty hours for the round trip. Manage your fatigue to fly safely. Log scenario history for audit support and learning. Whether revisiting the past to see how you dealt with a rigorous schedule, or evaluating a risk mitigation scenario for a future schedule, managing your scenarios is a powerful method to help you fly safely and more alert. Add Fatigue Meter PRO to your workflow today. Evaluate the effectiveness of your FRMS with individualized testing. Aviation Fatigue Meter Mobile App captures both subjective and objective reports of your flight crew’s alertness throughout their schedule, including safety critical phases of flight. These insights can be used as a foundation for evaluating and improving pre-flight and in-flight fatigue management strategies and other FRMS procedures. Survey your flight crew to spot overlooked fatigue related issues and trends. Pilots and cabin crew perform customized surveys and validated alertness assessments with a simple workflow that takes seconds. Surveys include the Samn-Perelli Scale and Karolinska Sleepiness Scale–two industry standard assessments for evaluating fatigue and sleepiness. Automatic data synchronization with secure data transfer. Leverage the gold standard in sleep science to get an objective, unbiased measure of crew alertness levels. The Psychomotor Vigilance Test (PVT) is a simple reaction time task that objectively measures alertness and is widely recognized in the field for its sensitivity to fatigue, medications and workload effects. Results are unaffected by aptitude, education level, or practice effects. The PVT can be used in various workflows, whether as part of a specific fatigue study or during routine flight operations. Set up and manage your crew’s data easily with the admin web portal. Configure which surveys and tasks each of the crew should complete as part of their standard FRMS process. Check survey and task results and monitor compliance. Add self-assessment surveys and the PVT to your FRMS. Gain access to our products and services with help from your insurance underwriter. Pulsar Informatics, Inc. is an IS-BAO Certified Support Services Affiliate. We can help you conform with both FAA and IS-BAO standards. Developing a culture of fatigue risk management can be a cost-neutral endeavor. Facilitate an operational field study for your aviation operation.